Has Alicia lost so much of her fan base that she’s turned to feminism to rekindle her career? First, she ditched the make-up. She thought going bare-faced was more authentic. Luckily for her she can get away with it; most feminist can’t. After writing that letter, Keys jumped into the deep end of the feminism pool, diving head-on into Leftism. Now, Keys celebrate the hijab and honors #MuslimWomensDay. Apparently, there’s a day for everyone. Ironically, yesterday was #NationalCleavageDay. I’m curious to see how feminists ultimately coalesce around these two dichotic constructs. When did the hijab become a symbol of feminism? In a further irony, Leftist women proudly wear the hijab at anti-Trump rallies. To protest the man who fights against female oppressors. It takes a lot of guts to protest in America. I wonder if the women who celebrated #NationalCleavageDay would be willing to bear all in Iraq? Leftist feminists obviously believe that wearing a hijab takes the oppression behind it away. I guess when the hijab is worn by “choice,” it’s a bit of a political fashion statement? Nevermind the millions of women forced to wear the wardrobe of submission. Submission to men, in case the feminists reading this miss the point. While President Trump met with female entrepreneurs to show support of their efforts, feminists were having a #MuslimWomensDay celebration. Social media blazed with women in hijabs declaring #WomensRights. Once again it Trump was the only one making sense in the madness. 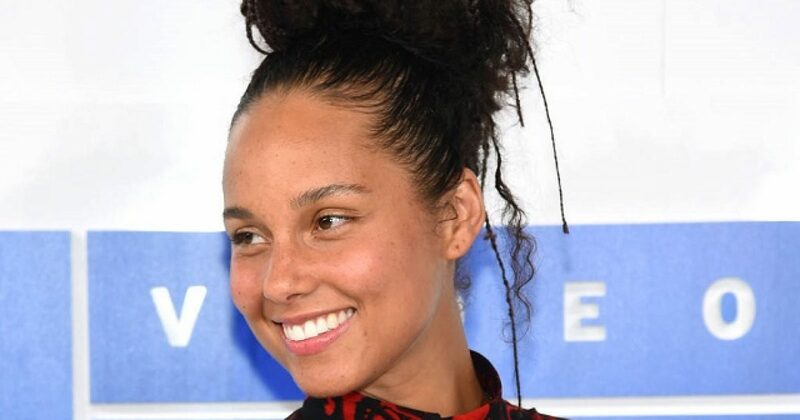 Alicia Keys decided to throw her support on the side of feminism. She tried to delete her post, but it was too late. She clearly took part in celebrating oppression. Keys was hoping her post would show her to be part of the loving and tolerant left. However, she didn’t exactly think that one through. Hannah Bleau was quick to call out Keys. You don’t have to be a genius to know it’s not exactly a symbol of feminist liberation. Quite the contrary. It’s a symbol of submission. It’s a symbol of female oppression. Plain and simple. You’ll never convince me otherwise. This is all about virtue-signaling. That’s it. It’s about looking like a tolerant, compassionate, open-minded, culturally enriched individual. Liberals look to American Muslims and go, “Look! It’s about freedom! They’re choosing to wear those!” That may be true, but it’s only because they live in America. We’re not going to beat them in the streets for taking them off. Women elsewhere don’t have that luxury. After Keys through in her two cents, many followed along on Twitter and weighed in. @USATODAY This is so laughable you should be embarrassed. Alicia picked the wrong side if she truly cared about the advancement of women. The morons celebrating the hijab as a symbol of female liberation are the same morons lambasting President Trump– the same President Trump who’s meeting with female business owners. Feminist logic at its finest. Let’s hope Alicia Keys learned her lesson.